The Yaesu FR-50B came with a slightly unusual RCA antenna connector. Most users replaced it with a more common SO239 (as in the image above). The screw terminals on the back are for speakers and MUTE functions. Stability was actually good for being all tube radio. Selectivity was poor by today's standard. It was just OK back then. There was an option to have an crystal controller fixed channel switches (located on right of the frequency display window). It is uncertain whether or not the rig supported AM mode. Can anyone confirm? Estimating the value of a rig can be challenging. 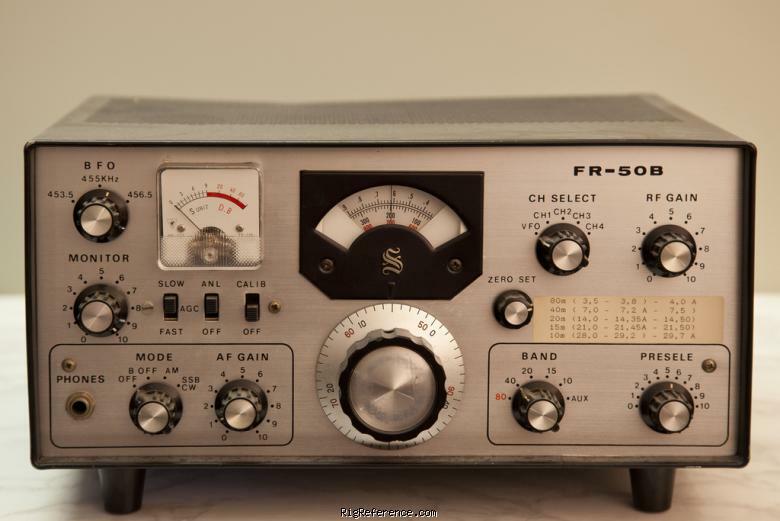 We collect prices paid by real hams over the years to help you estimate the current value of the Yaesu FR-50B. Just bought or sold this model? Let us know what you traded it for and help other ham operators!